Car sales down, discounts up | What Car? 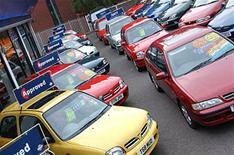 New car buyers are set to be offered even greater bargains as car sales plummeted during November. According to figures released by the SMMT, registrations were down 36.8% year-on-year in November with private sales down a massive 45.1%. The falls are the sharpest experienced by the car industry since June 1980. The biggest losers include cash-strapped Chrysler, which sold just 133 cars during November, Mitsubishi, which sold 362, an Alfa Romeo, which sold 251. While no car manufacturers with listed figures sold more cars this November compared to last November, Volvo, Jaguar and Ford's figures defied the worst of the downturn. However, the decline in sales is also sharper than many industry analysts predicted, prompting predictions that new car discounts which are already at record levels will get even bigger. 'November has been another difficult month for the motor industry and while some consumers may have delayed their purchases to take advantage of the recent VAT reductions, overall demand continues to fall,' said Paul Everitt, SMMT chief executive.